After graduating in 1965, Bouchles earned a B.A. in political science from the University of Maine at Orono, and married state representative Peter Snowe in 1969. In 1970, Olympia Snowe worked at the Auburn Board of Voter Registration as a Republican member, also campaigning for Senator Margaret Chase Smith’s final election to the United States Senate. In 1972, Olympia Snowe began working as an office manager for the newly-elected Republican to the U.S. House of Representatives and future Secretary of Defense, William S. Cohen. In April 1973, while returning to Auburn from his Augusta office in a late season snow storm, Peter Snowe’s car flipped over on the icy highway, killing him instantly. At the urging of Maine Republican officials, Olympia Snowe ran successfully for her husband’s vacant seat. “I certainly had not contemplated running for public office. I like behind-the-scenes work,” she recalled. “The only reason why I decided I should probably do it was that I had such a strong passion for politics.”4 She won a full term in 1974 and was elected to an open state senate seat in 1976. In 1978, when Representative Cohen vacated his U.S. House seat to run for the U.S. Senate, Snowe entered the race to succeed him. The district—one of two in Maine—covered the rural northern two-thirds of the state. Snowe’s principal opponent was Democrat Markham Gartley, Maine’s secretary of state who had gained notoriety for being the first prisoner of war released from North Vietnam in 1972.5 Snowe used tactics that Cohen had taught her in her campaign, crisscrossing the geographically largest district east of the Mississippi River by foot in a flannel shirt and hiking boots, attending town meetings along the way. With more than one-third of the state’s population registered to vote as Independents—more than registered Republicans or Democrats—the Maine electorate generally favored moderate politicians.6 Campaigning to this constituency, Snowe prevailed with 51 percent of the vote to Gartley’s 41 percent.7 Upon her victory, Snowe became the youngest Republican woman to serve in the 96th Congress (1979–1981), as well as the first Greek-American woman to be elected. 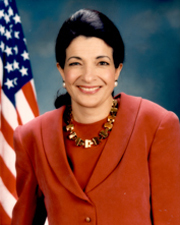 When Representative Snowe took her seat in the 96th Congress (1979–1981), she received assignments on three committees: Government Operations; Small Business; and the Select Committee on Aging. Two years later she took a seat on the Foreign Affairs Committee—where she remained for the balance of her House career. In the 98th Congress (1983–1985), after leaving her Small Business post, Snowe was assigned to the Joint Economic Committee, where she remained until her final House term, when she won a seat on the Budget Committee. Snowe was a member of the Congressional Caucus for Women’s Issues for her entire career, chairing the caucus during the 98th Congress. 1Martha Sherrill, “The Sisters of Maine,” 6 May 2011, Washington Post: C1. 2Barbara Mikulski, et al., Nine and Counting: The Women of the Senate, 1st ed. (New York: William Morrow, 2000): 65–68. 3“Snowe, Olympia J.,” Current Biography Yearbook, 1995 (New York: H.W. Wilson and Company, 1995): 544. 4Quoted in “Snowe, Olympia J.,” Current Biography Yearbook, 1995: 544. 6Ibid., 545; Congressional Quarterly, “Sen. Olympia J. Snowe (R-Maine),” CQ Member Profile, 108th Congress, http://www.cq.com/members.do?memberCode=S0372 (accessed 31 Mar 2004; site discontinued); Margot Hornblower, “House Panel Votes to Scrap Maine’s Dickey Dam Project,” Washington Post, 27 July 1979: A6. 7"Election Statistics, 1920 to Present"; “Snowe, Olympia J.,” Current Biography Yearbook, 1995: 543–544. 8Mary Agnes Carey, “Sen. Olympia J. Snowe,” 28 December 2002, CQ Weekly: 36. 9“Snowe, Olympia J.,” Current Biography Yearbook, 1995: 545. 11Ana Puga, “In Maine’s Rep. Snowe, GOP Finds a Role Model,” 2 August 1993, Boston Globe: 1. 12“Snowe, Olympia J.,” Current Biography Yearbook, 1995: 546; John E. Yang, “House Upholds Reagan’s Veto of Trade Limits,” 7 August 1986, Wall Street Journal: 5. 13“Snowe, Olympia J.,” Current Biography Yearbook, 1995: 546. 14Douglas C. Waller, Congress and the Nuclear Freeze (Amherst: University of Massachusetts Press: 1987): 116; “Snowe, Olympia J.,” Current Biography Yearbook, 1995: 545; Rowland Evans and Robert Novak, “Arming Managua,” 16 June 1986, Washington Post: A11. 15“Love of Politics Brings More,” 20 February 1989, New York Times: A12. 16Thomas Fields-Meyer, et al., “Survival Skills,” 18 June 2001, People: 121. 17Leslie Phillips, “Mitchell Leaving Bewilderment in his Wake,” 7 March 1994, USA Today: 4A. 19Garrison Nelson and Charles Stewart, III, Committees in the U.S. Congress, 1993–2010 (Washington, D.C.: Congressional Quarterly Press, 2011): 956–957; Congressional Directory, 112th Congress (Washington, D.C.: Government Printing Office, 2011): 473. 20Politics in America, 2008 (Washington, D.C.: Congressional Quarterly Inc., 2007): 448–449; Politics in America, 2012 (Washington, D.C.: Congressional Quarterly Inc., 2011): 433. 21“Snowe, Olympia J.,” Current Biography Yearbook, 1995: 547. 22Allison Mitchell, “Senate G.O.P. Again Prevails on Health Care Bill,” 15 July 1999, New York Times: A1. 23Politics in America, 2010 (Washington, D.C.: Congressional Quarterly Inc., 2009): 452; “Discrimination Outlawed,” Congressional Quarterly Almanac, 2008 (Washington, D.C.: Congressional Quarterly Inc., 2009): 9-15–9-16. 24Carey, “Sen. Olympia J. Snowe:” 35. 25Politics in America, 2010: 452. 26Carey, “Sen. Olympia J. Snowe:” 35; Politics in America, 2004 (Washington, D.C.: Congressional Quarterly Inc., 2003): 447–448; Fields-Meyer, et al., “Survival Skills:" 121. 27Congressional Quarterly, “Sen. Olympia J. Snowe (R-Maine);” Carey, “Sen. Olympia J. Snowe:" 35. 28Carey, “Sen. Olympia J. Snowe:” 35–36. 29Politics in America, 2008: 448; Gail Russell Chaddock, “Senate Pact Shapes High-Court Fight,” 5 July 2005, Christian Science Monitor: 1; “’Gang of 14’ Showdown Averts Judicial Shutdown,” Congressional Quarterly Almanac, 2005 (Washington, DC: Congressional Quarterly Inc., 2006): 14-8–14-9. 30Politics in America, 2008: 448. 31Jill Lawrence, “Social Security ‘Crisis’ Questioned,” 24 January 2005, USA Today: A1. 32Politics in America, 2010: 452. 33Manuel Roig-Franzia and Paul Kane, “Two Moderate GOP Senators Give Big Voice to Little Maine,” 16 February 2009, Washington Post: A1; n.a., “Stimulus Bill: As Maine Goes. . .,” 4 February 2009, Boston Globe: A14. 34Lisa Wangsness and Susan Milligan, “Snowe Went 'Back and Forth ‘Till the End,” 14 October 2009, Boston Globe: A8; Mark Z. Barabak, “The Most Watched Woman in Washington,” 9 October 2009, Los Angeles Times: A1. 35Politics in America, 2012: 433. 36Paul Kane, “Citing Partisanship, Maine's Snowe Plans to Retire from the Senate,” 29 February 2012, Washington Post: A5. 37Olympia’s List, available http://www.olympiaslist.org (accessed 1 October 2014). "Olympia Snowe," in Women in Congress, 1917-2006. Prepared under the direction of the Committee on House Administration by the Office of History & Preservation, U.S. House of Representatives. Washington, D.C.: Government Printing Office, 2006. Snowe, Olympia. Fighting for Common Ground: How We Can Fix the Stalemate in Congress. New York: Weinstein Books, 2013. Snowe, Olympia, et al., Nine and Counting: The Women of the Senate. New York: William Morrow, 2000. U.S. Congress. Tributes Delivered in Congress: Olympia J. Snowe, United States Congresswoman, 1979-1995, United States Senator, 1995-2013. Washington: U.S. Government Printing Office, 2014.